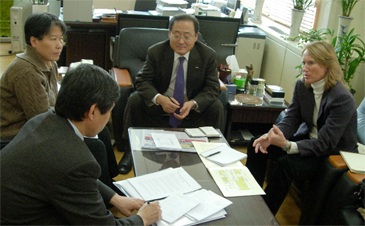 SportAccord Official Makes Inspection Tour to Seoul: Ms. Anna Hellman (right), general manager of SportAccord, talks with WTF Secretary General Dong-hoo Moon (center) and other WTF officials when she visited the WTF Headquarters in southern Seoul on Feb. 2, 2006, to check the Seoul Organizing Committee's preparations for SportAccord 2006, which is scheduled for April 3-7, 2006. Some of the most influential people in sport will be speaking at SportAccord 2006, which takes place at the Grand InterContinental Hotel in Seoul, South Korea on April 3-7, 2006, according to a press release by SportAccord on Feb. 10, 2006. Over 30 speakers have already signed up for the sell-out exhibition which will be brimming with bidding cities, major events companies, International Sports Federations and commercial partners. The speakers include John Furlong, the Chief Executive of the Vancouver 2010 Winter Olympic Games and Gilbert Felli, Olympic Games Executive Director of the International Olympic Committee (IOC). Sports represented by the speakers are as diverse as basketball, gymnastics, cycling, rugby, hockey, polo tennis, rowing, squash and motor racing. There will also be a host of speakers from cities bidding for sports events in regions from Melbourne to Rio to Glasgow. Mike Lee, the former Director of Communications & Public Affairs for the London 2012 Olympic bid, will be speaking about "Bidding Cities: Strategies For Success In The International Event Market." "I am delighted to be speaking at SportAccord 2006 – the event seems to grow in influence and impact every year," says Lee, who now heads his own company, Vero Communications Ltd. "My focus will be on the story of how London won the race for the right to host the Olympic and Paralympic Games in 2012, the lessons of the campaign and the legacy of the bidding process. It is a particular pleasure to be involved this year as SportAccord 2005 was a special moment in London's Olympic campaign." Terrence Burns: President & CEO, Helios Partners, Inc.
Mitchell (Won Euy) Hong: Chief Executive, Eclat Entertainment Inc.
Mike Lee: Chief Executive, Vero Communications Ltd. The speakers will take to the stage in front of an audience of delegates which will include representatives of International Sports Federations and Associations, the IOC Executive Board, bidding and host cities, Olympic Games Organizing Committees, world multi-sports games Organizing Committees, broadcasters, architects, suppliers, infrastructure companies, consultants, insurance & finance companies, CRM/technology companies, hospitality & ticketing, lawyers and sponsors. Peter Mann is the Executive Chairman of pmpLEGACY, a Silver Sponsor of SportAccord. He will be acting as a moderator at the conference. "Having attended last year's event in Berlin, we could not fail but be impressed by both the high quality of international delegates and the conference papers," he says. "This really is the event to attend for cities thinking of bidding for a major sporting event!" For biographies of speakers and a list of discussion topics, please visit www.sportaccord.com. About SportAccord SportAccord, the annual international sports convention, brings representatives from the 100 International Sports Federations affiliated to GAISF (General Association of International Sports Federations), ASOIF (Association of Summer Olympic International Federations) and AIOWF (Association of the International Olympic Winter Sports Federations), as well as the International Olympic Committee Executive Board, together with sponsors, architects, sports lawyers, broadcasters and other specialists to discuss the key issues facing the sports movement. Owned by GAISF, ASOIF and AIOWF, SportAccord encompasses the annual Associations' Congress and General Assemblies. The convention includes open conference sessions, workshops, seminars, scheduled networking opportunities and an exhibition, all scheduled around the Associations' meetings.